If you receive new electronic devices over the holiday season, please remember the Neptune Township Department of Public Works no longer collects E-Waste curbside. TVs & Computer Monitors If the (CRT) picture tube is not smashed and is still intact with all components it will be accepted for disposal. Scrap parts from dismantled TVs / monitors, computers, etc. are not eligible for the Neptune Township E-Waste Recycling Program. NOTE: It is illegal to dismantle E-Waste for parts unless you are a NJDEP permitted Class D Recycling Facility. For a number of years, the Township of Neptune Department of Public Works has not accepted grass cuttings from homeowners. We have encouraged the NJDEP recommended policy “cut it and leave it” lawn care and will continue to do so. It has become obvious that many of our residents want an alternative to this policy. In an effort to keep grass out of the garbage containers, gutter lines, storm drains and water ways we will begin accepting grass clippings at the Recycling Center from residents beginning July 1. Residents must bring the grass only and not mixed with any other yard waste, leaves or brush to the Neptune Township Recycling Center located at 2201 Heck Ave, Neptune during the hours Monday - Friday 8 am - 7 pm & Saturday & Sunday 8 am - 3 pm. The Neptune Public Works Department welcomes your questions, comments and suggestions. What are your likes or dislikes about a particular program? Residents are reminded that mailboxes and supports must be installed and maintained to withstand the rigors of snow removal. Mailboxes should be 15 inches away from the edge of the roadway and 42 inches high to the bottom of the mailbox. The DPW will repair or replace mailboxes and / or posts that are actually struck by a plow blade or truck. DPW staff investigates each complaint. If an inspection shows that the mailbox was hit by plow equipment, a standard 4x4 post and standard mailbox will be installed. If no signs of impact are evident, the resident is provided information about the possible reasons for the problem, including inadequate construction, materials or maintenance. For many years The Township of Neptune has worked with Monmouth County to recycle common carbon-zinc and alkaline batteries (i.e. AAA, AA, A, C, D and 9 volt). This program will end immediately. These batteries should now be disposed with regular household and commercial trash. Why are these changes taking place? According to Monmouth County officials, when this program began, there were significant levels of toxic metals present in household batteries. Toxic metals have been reduced or eliminated in these common batteries the past ten years. In addition, the costs to recycle or dispose of these batteries continues to increase. Recently, and in response to several incidents where fires have broken out in vehicles transporting drummed batteries, the Federal Department of Transportation (USDOT) has implemented new transport rules mandating that each battery be individually bagged and /or terminals taped. Therefore, continuation of this household battery recycling program will become prohibitively expensive, at a time when the need for this segregation of these spent batteries has become almost academic. Button Cell Batteries: (miniature disc/coin sized) will continue to be collected and shipped to the Monmouth County Hazardous Waste Facility. Button cell batteries can contain up to 25 milligrams of mercury per battery, and are considered a hazardous waste. Found in photo equipment, watches, hearing aids, watches and other electronic products. 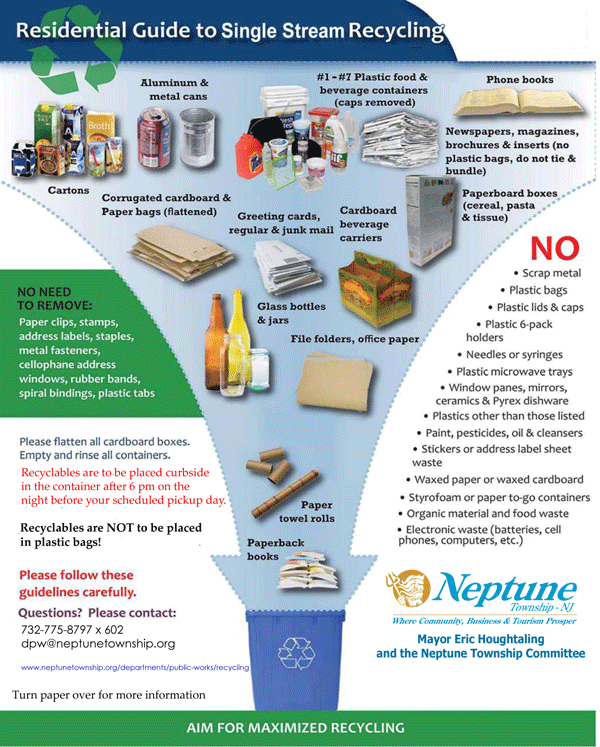 The Township of Neptune is removing all battery collection containers from all sites with the exception of the recycling center. The Neptune Township Recycling Center is located at the westernmost entrance to our Public Works Facility at 2201 Heck Ave. The hours of operation are Monday through Friday 8:00 AM to 7:00 PM Saturday and Sunday 8:00 AM to 3:00 PM. Not open on Township holidays. Neptune Township proof of residency must be presented to the inspector to enter the facility.